Throughout South America I’ve cooked a lot. This has been a surprising development to my travels. 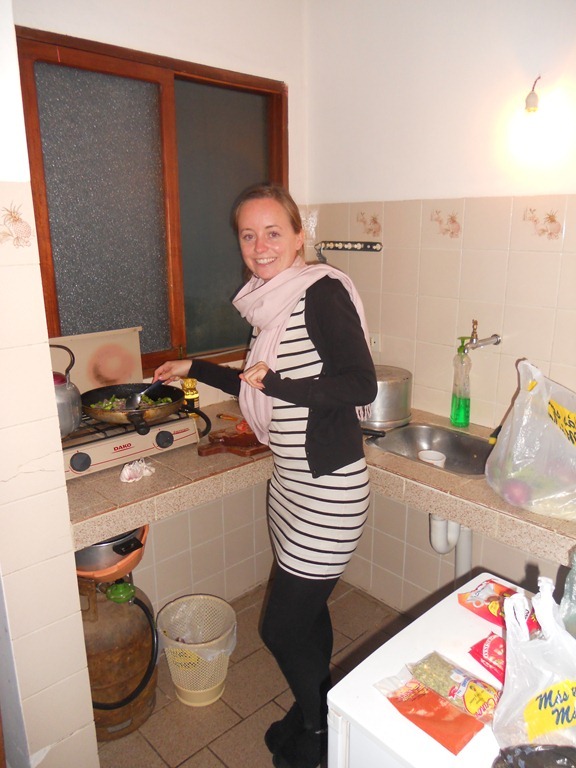 When I travelled around South-East Asia I never dreamt of cooking, well I couldn’t have cooked even if I’d wanted to, beach bungalows don’t tend to come with kitchens! Plus in South-East Asia eating out is cheap, whether it’s at a roadside stall, a night market or even a respectable restaurant, eating out in South-East Asia never empties the purse. The same can not be said of South America. Yes, you can find cheap food here and there. In Ecuador and Peru good, cheap restaurants offering great almuerzo (lunch) and cena (dinner) deals, were often just around the corner. (An almuerzo and a cena deal is a menu of the day, you get a soup, main course, dessert and either a juice or a hot drink, for a reasonably cheap price, perfect). (Photos: They all show typical almuerzo and cena meals from Colombia, Ecuador and Peru rarely more than$2). In Colombia it was a little harder to eat out cheaply, so sometimes I did cook there but Colombia was at the start of my trip so I could easily splurge on eating out. 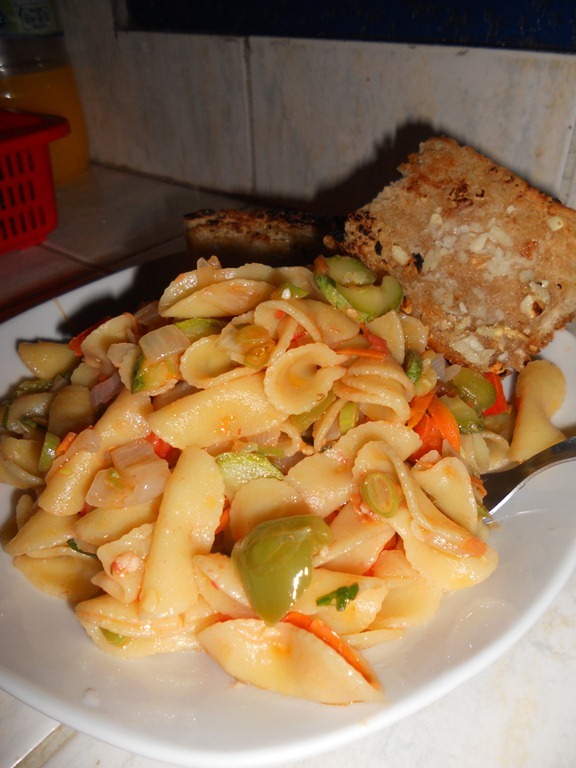 However in Bolivia good food was hard to come by never mind cheap food. In Bolivia the good cena deals stopped. If you wanted to eat out cheaply it had to be for lunch. The almuerzo deals were still everywhere. The main problem I had was the quality of the food. 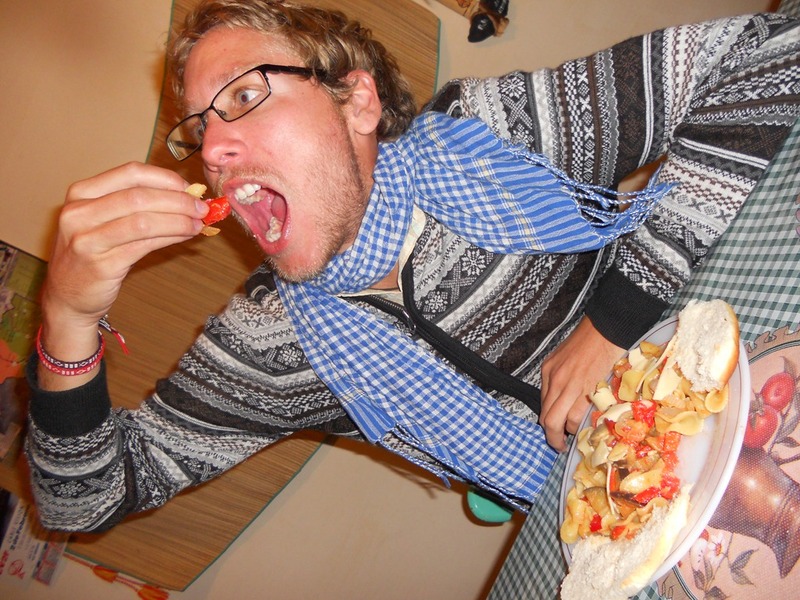 From my experience of Bolivia the food was boring and really, really bland. The meals on offer weren’t even worth their cheap price tag. 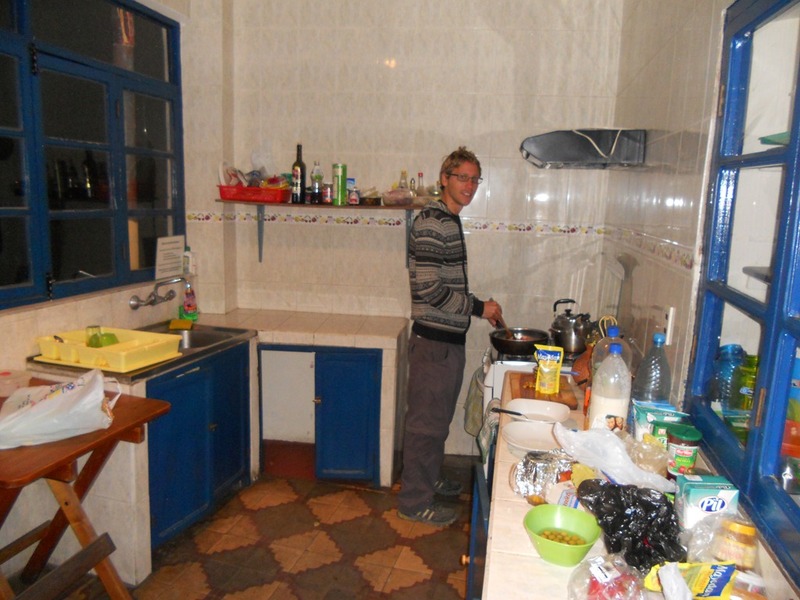 Therefore 95% of hostels in Bolivia came with a kitchen. As a result of this I really enjoyed cooking dinner every night. I’m not saying I’m the greatest cook but even the worst you could do would be better than eating out in Bolivia. 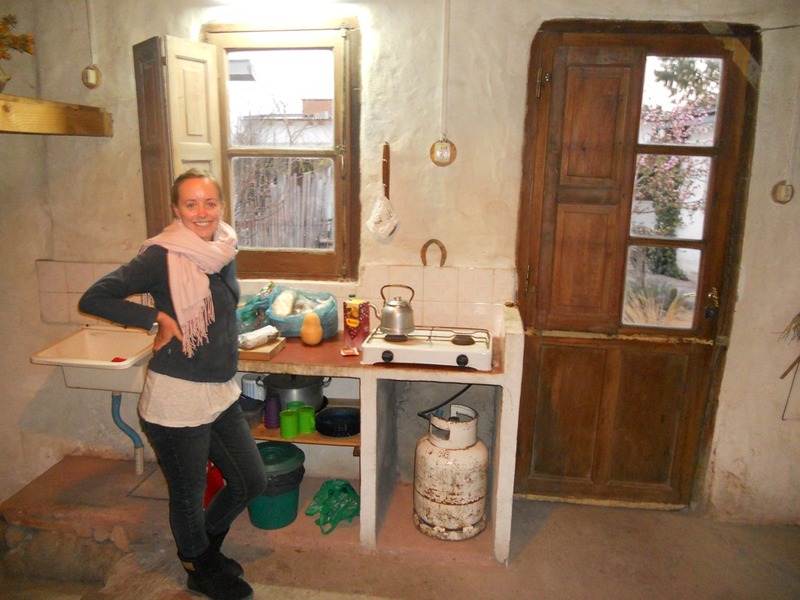 (Photos: Top left is the kitchen in La Dolce Vita hostel, Sucre, Bolivia. The best kitchen so far. 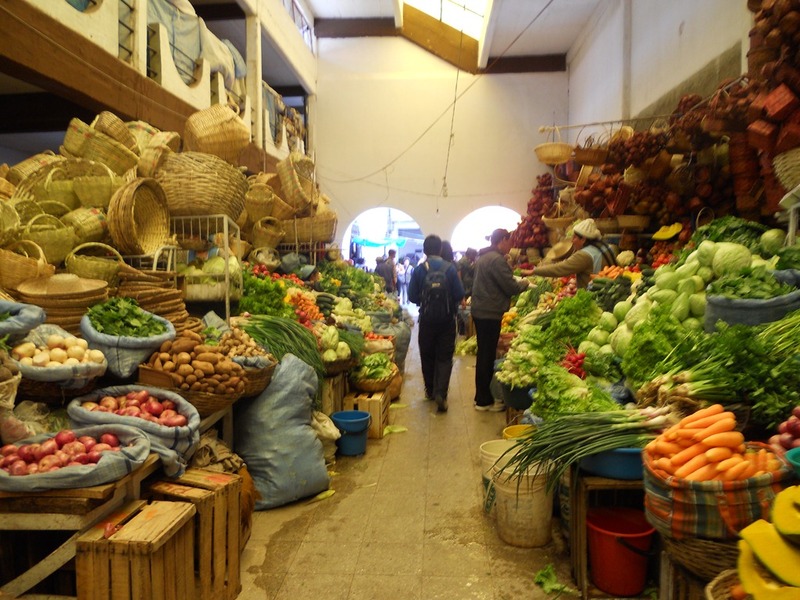 Top right is the fantastic market in Sucre, Bolivia, such great produce and absolutely massive. 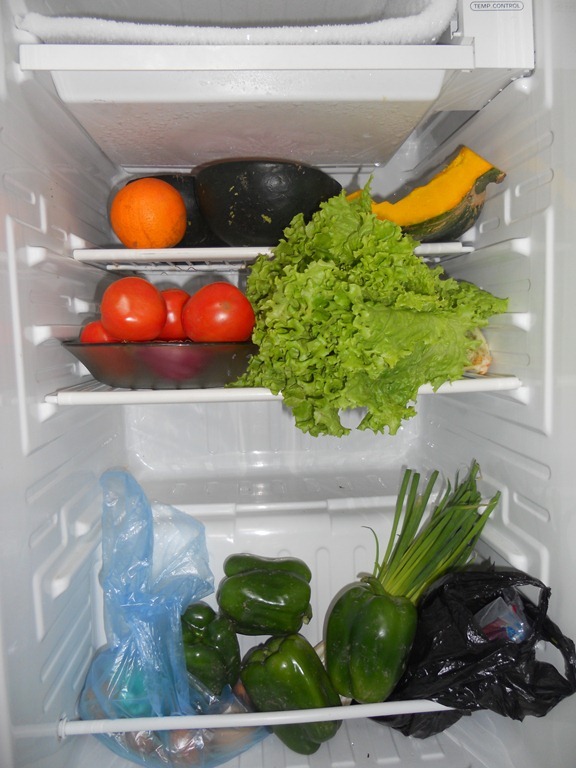 Second row, cooking in Samaipata, Bolivia & great veg from the market. Third row on the left cooking in Banos, Ecuador. Third row on the right cooking pancakes in Salento, Colombia). The other night I met an English couple who had also travelled from Caracas in Venezuela. (They are the only travellers I’ve met who’ve done the same trip as me and Tom, we agreed that the cheap flight from London to Caracas was the temptation). They had spent four months travelling from Caracas through Colombia, Ecuador, Peru, Bolivia and Argentina, where we met them in Salta. (I must be a slow traveller, it’s taken me seven months). They agreed that the food options in South America hadn’t been great. They complained about the dominance of deep fried chicken and the lack of vegetables and fresh food. They were also really down on what was on offer in Bolivia. Therefore they too had been cooking a lot. It was nice to know that I’m not the only traveller who has had trouble with the Bolivian food. Although the English guy said he was from South London so he’d grown up on deep fried chicken and not a lot of fresh vegetables, therefore he said the South America food options made him feel at home, ha-ha. 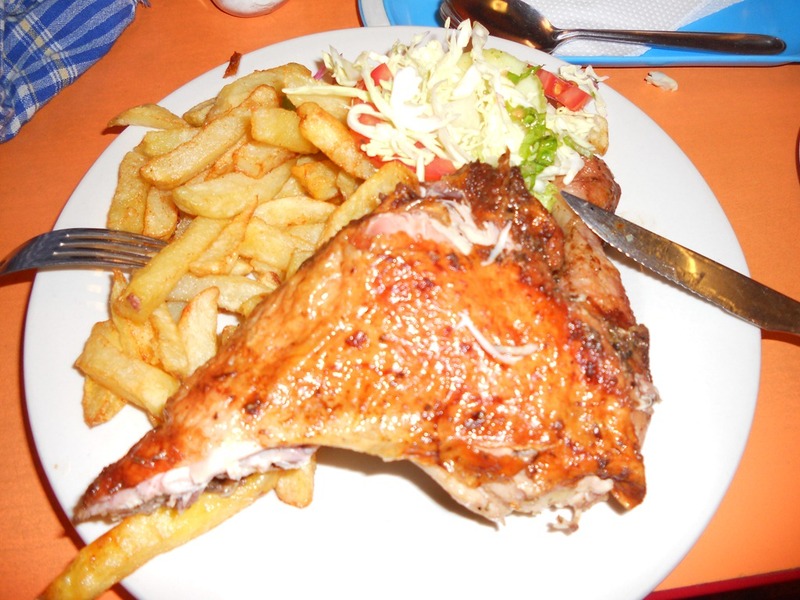 (Photo: A typical chicken meal found all over South America. In particular this meal dominates Peru’s cuisine. These chicken restaurants are on every street corner. They have enormous rotisserie ovens filled with chickens. You can order an 1/8, 1/4, 1/2 or a whole chicken. It comes with chips and usually a small salad. This photo shows one of the better chicken meals I’ve eaten, some of them can be pretty grotty. At first it was great to have roast chickens everywhere, but when that became the only option it started to get pretty boring. Plus you’re not going to live very long if you eat chicken and chips everyday). I’m in Argentina now and WOW there are a lot of fantastic restaurants, it couldn’t be more different from Bolivia if it tried. You just need to walk down the street and your nose can sniff out the famous parilla (steak house) and asado (BBQ). BUT as I’m sure you know Argentina is expensive, seriously expensive, especially coming from Bolivia. Some things are three or four times the price. Unfortunately on a backpacker’s budget, a backpacker who has already done ten months of backpacking before arriving in Argentina, I can’t even splurge boohoo. In Argentina 100% of the hostels come with a kitchen which is fantastic but for me a little frustrating. In Bolivia I desperately wanted to cook because of the poor food options but in Argentina I desperately want to eat out but I can’t because of the price. 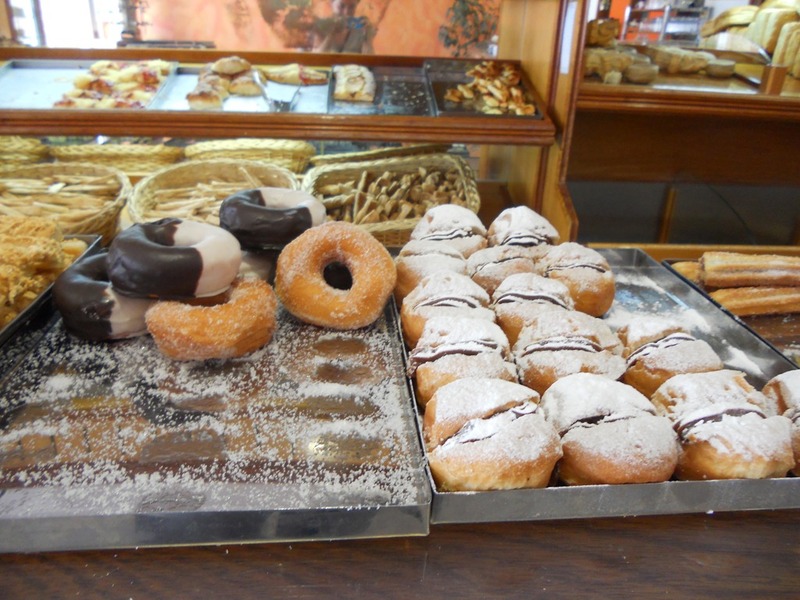 However on a positive note there are fantastic bakeries and good local produce. Instead of emptying my purse in a restaurant I go to the bakery and the local market to stock up on plenty of vegetables, cheese, wine, chorizo…you name it! I can get ingredients for a couple of meals for half of the restaurant price for one. 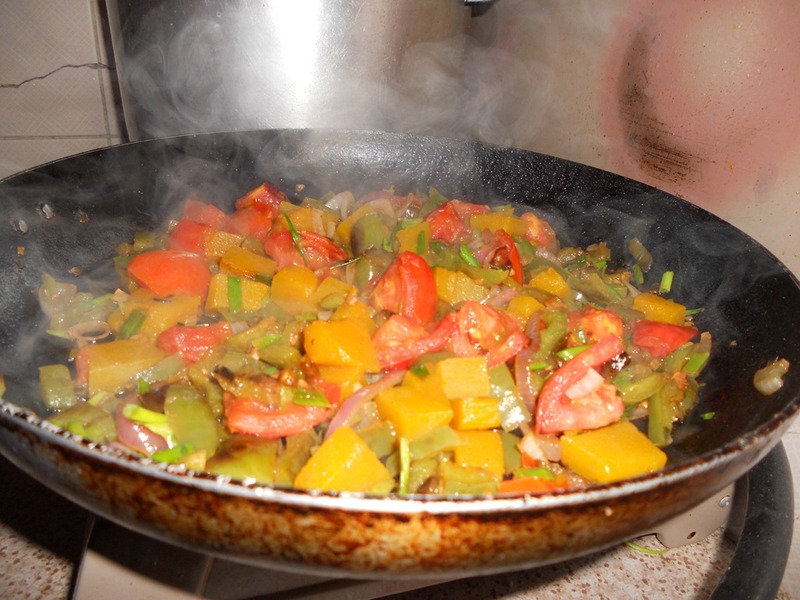 Then I attempt to cook the restaurant meal myself (it’s never as good but I pretend it is)! One day I’ll come back to Argentina on a holiday budget and I’ll empty all the restaurants then mmmhmmm! 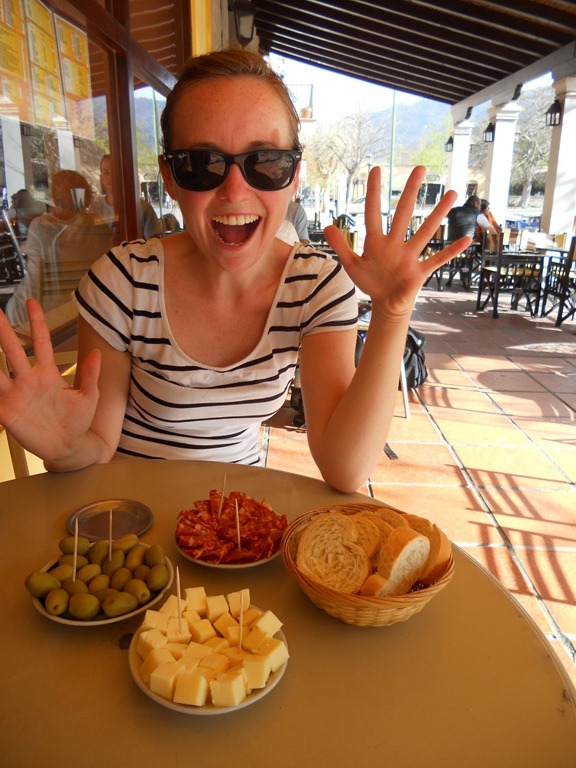 (Photos: Top left, my excitement at finding that Argentine restaurants serve tapas, taken in Cafayate. CHEESE, OLIVES & CHORIZO YES PLEASE! 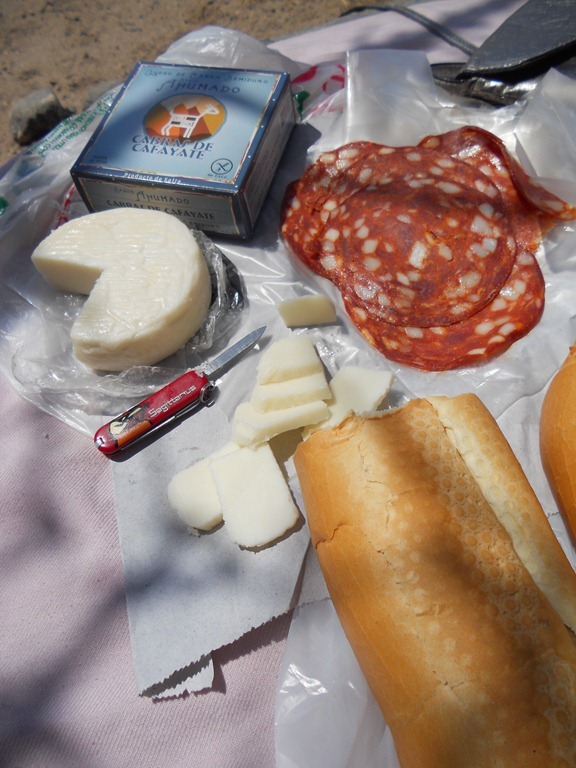 Top right, recreating the restaurant tapas on a couple of picnics. 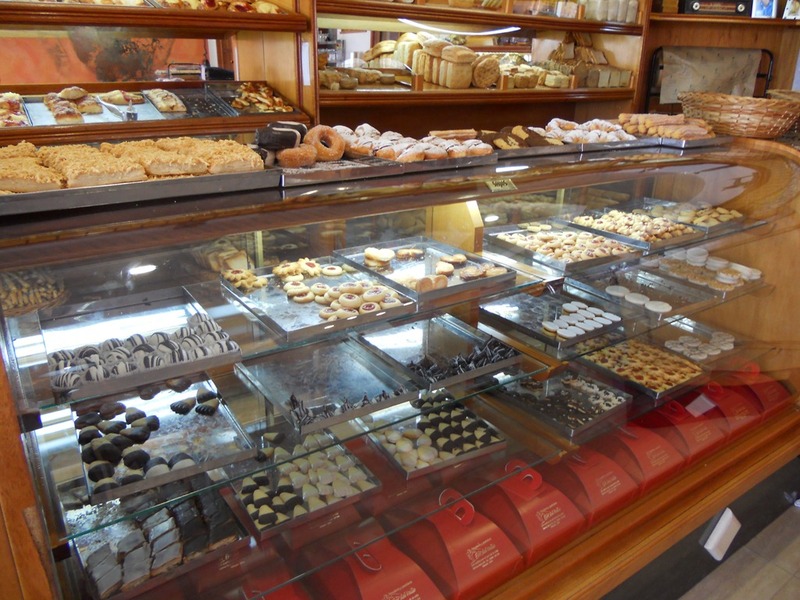 Second row, incredible Argentine bakeries. Third row, good meat and huge wine shops in Argentina. 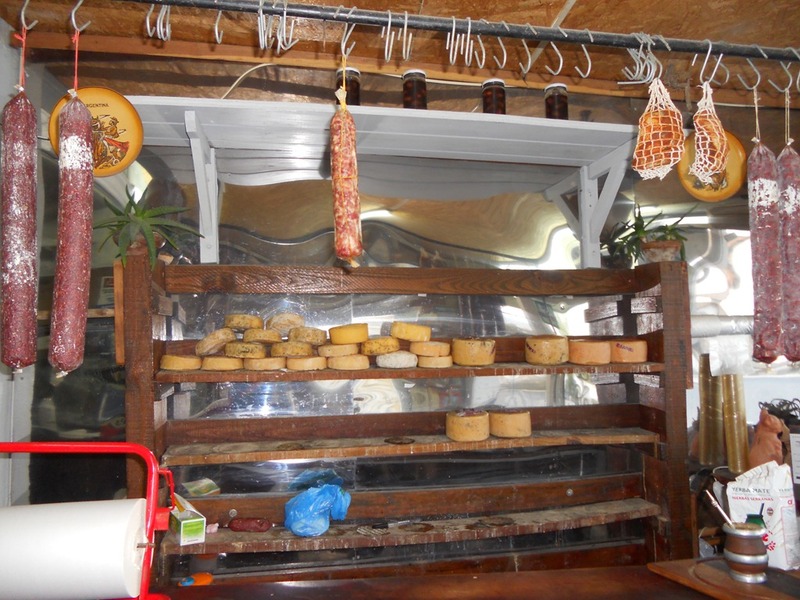 Last row, a cheese and chorizo shop in Tafi del Valle, Argentina). I stumbled across something interesting in a guidebook the other day. 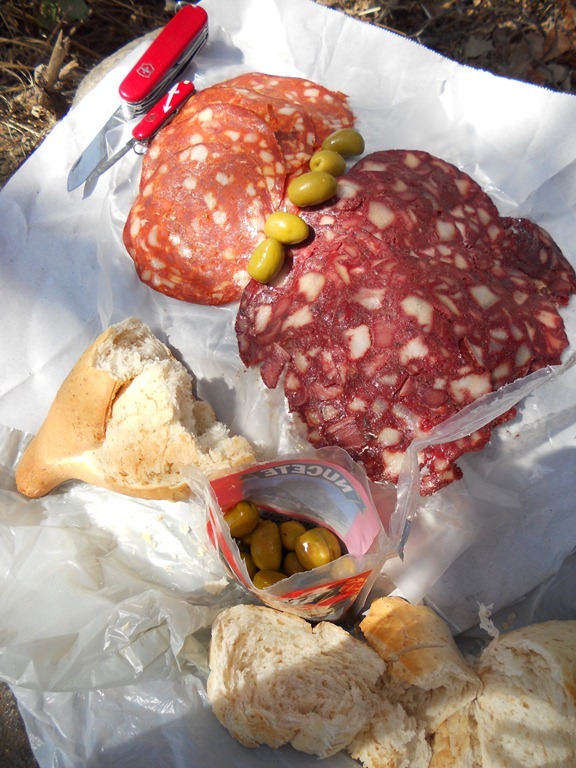 Apparently around Mendoza, the famous red wine area of Argentina, you can do a gourmet wine tasting tour. This involves a five course meal (yes) with a different wine to taste with each course (yes, yes, yes). My kind of meal. As a treat me and my boyfriend are thinking of doing one. The idea has been that in each South American country we do something that we’ve never done before. In Colombia we went horse riding in the hills around Salento. In Ecuador we went white water rafting along the crazy rivers of Tena. In Peru we watched an incredible sunrise over Machu Picchu and in Bolivia we tested our nerves riding bikes down The Death Road (the world’s most dangerous road). I know what you’re thinking there is nothing food related on that list and I’m all about the food. So, what about a delectable five course taste sensation in Argentina’s wine capital??? I think so! 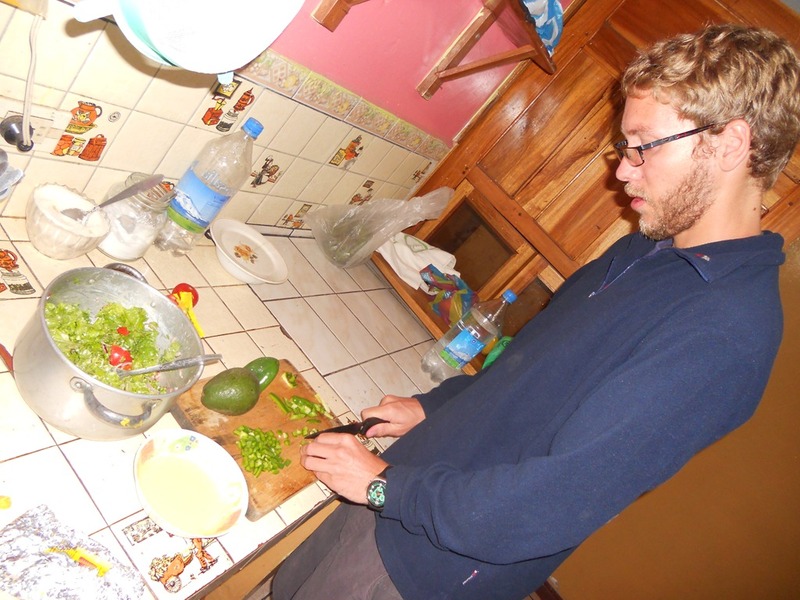 Best Kitchen: Bolivia – Sucre – La Dolce Vita Hostel. (Every utensil you could need; big; lots of work surface space; a recipe book you could use & add to; a huge free shelf; great storage so no-one could take your things by mistake; new pans & lots of them: sharp knives: wine glasses & bowls…this is not very common!). (Really dirty; not used; ants in lots of the cupboards & on lots of the pots; really old pots & pans; the gas hob ran out of gas whilst I was in the middle of cooking ). (Because there was a large sign above the kitchen counter which stated “DO NOT USE GARLIC”. You could not use garlic in their kitchen. I asked why and they said that Israelis go a bit crazy with garlic and get it everywhere, so they had to ban it. Ha-ha!). (Fancy because it was in our room, our own private kitchen. We had a bedroom, a lounge and a kitchen! Yes, we are backpackers I promise). 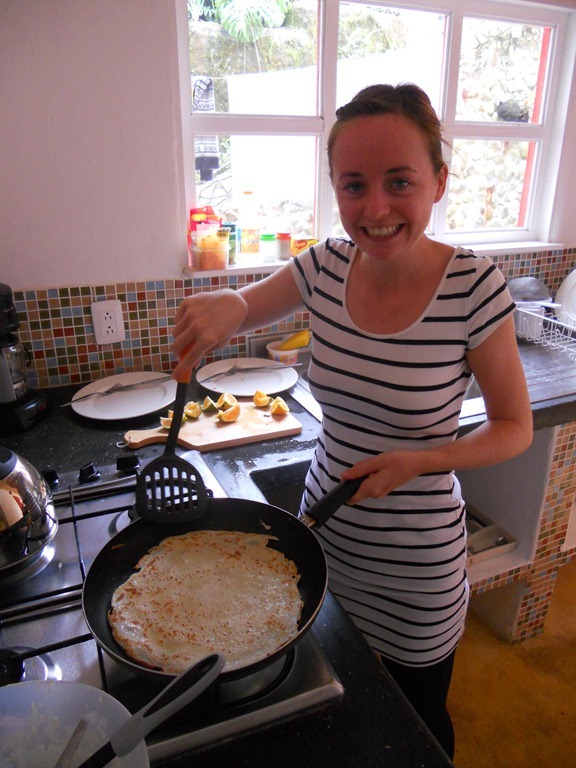 (As we had our own private kitchen next to our lounge we cooked pancakes every day TWICE a day. Oh dear). 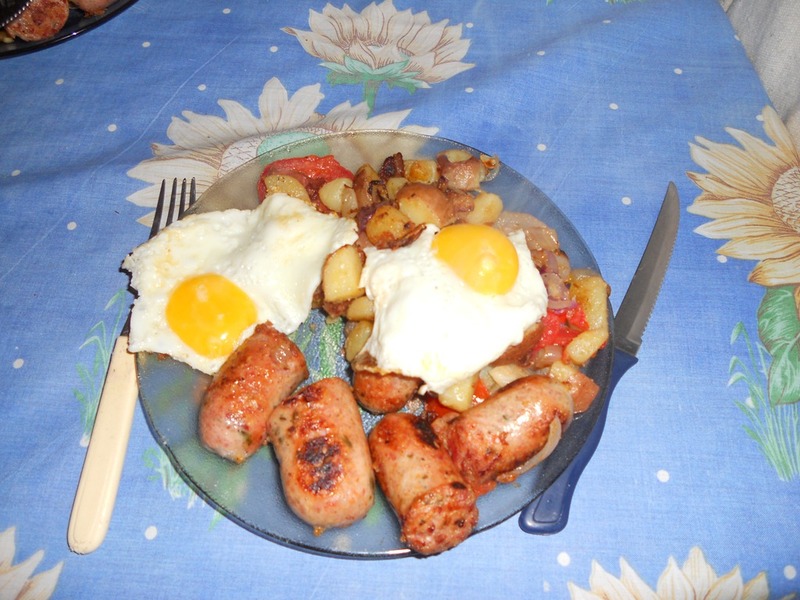 (On our last night at this hostel we had to wait about two hours to cook, we ended up cooking at 11pm! The kitchen was incredibly busy. Each time I went to try and cook it was just too full and there was no room. Boo!). (Due to the cheap, cheap cost of this hostel (a great hostel at that) and as a result of cooking each night, this was our cheapest travelling week). (No matter where we looked we couldn’t find any utensils or knives and forks. We searched everywhere and couldn’t find anything. 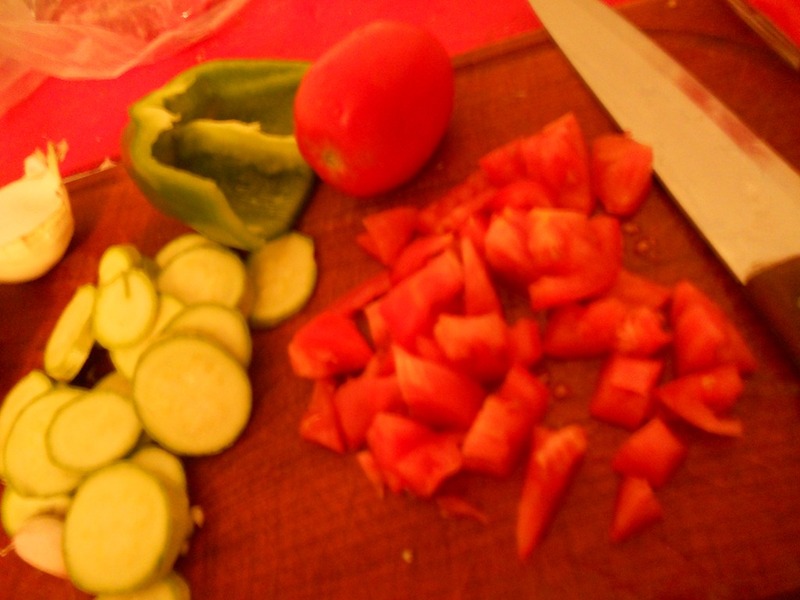 SO we used our trusty travellers pen knives to chop and stir….then we ate with our hands. The next day we found knives and forks in a drawer underneath the dining table…oops!). 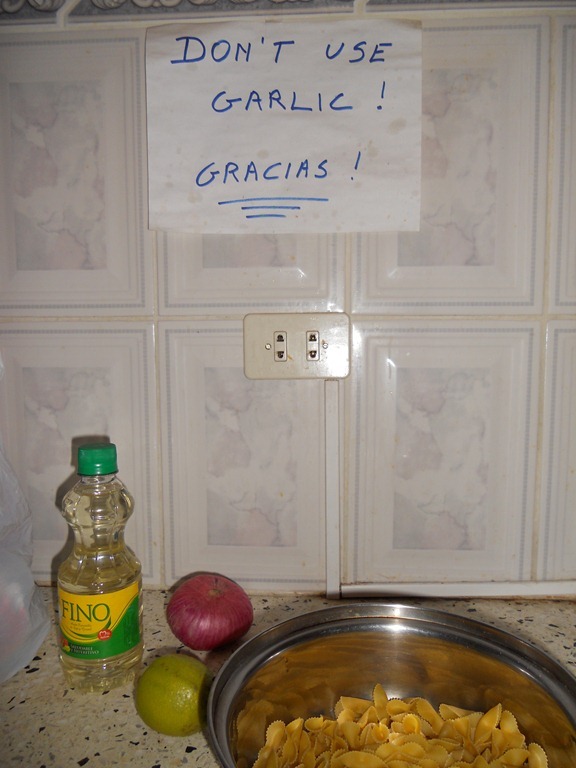 (Photo: here is the proof that one crazy hostel banned the use of garlic in its kitchen). You often find that the quality of the utensils in a hostel’s kitchen are poor, the knives are usually really blunt. My boyfriend picked up a great trick from a Bolivian traveller. To sharpen a blunt knife he turned a mug upside down and quickly ran the knife back and forth along the mugs hard edge. It really works, it sharpens the knife! 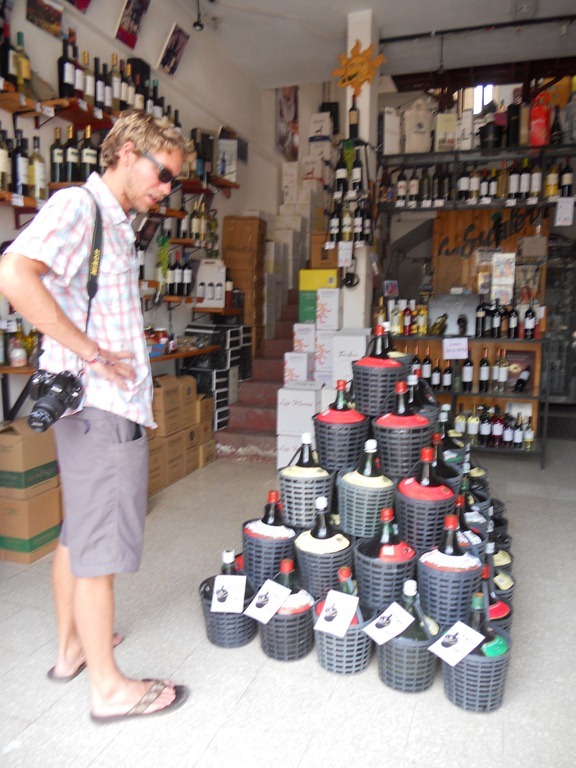 In Argentina there is cheap wine everywhere and it’s good quality. One evening I decided that I wanted to make mulled wine but I thought buying all the spices and flavourings would make the day an expensive one (yep I’m really on a low budget now). Then I realised I already had some cinnamon and clove tea bags. So I put the wine in a pot on the hob with two tea bags and some sugar. I brought it to the boil and guess what, it tasted just like mulled wine! I didn’t have to blow my budget buying all the spices, I just used tea bags I already had. Pasta is always cheap everywhere and it’s rucksack friendly. Often you’ll cook in a place and then have to move on the next day so you have to think about what to buy carefully as you’ll need to pack it into your rucksack. Therefore I always carry pasta as it’ll last for a few meals and it’s not as heavy as rice. I wish I could carry potatoes around but they’re just too heavy. Carrying garlic and spices is also really useful. If you turn up somewhere too late for the shops at least you’ve got some flavourings with you and they take up no space in your rucksack. I don’t often cook with meat because it’s normally really expensive, it sends me over my daily budget. Plus at the market it’s normally not refrigerated and really bad quality. In a market in Bolivia all the cuts of meat where mixed in next to open horse and cow carcasses, SO I didn’t fancy that! 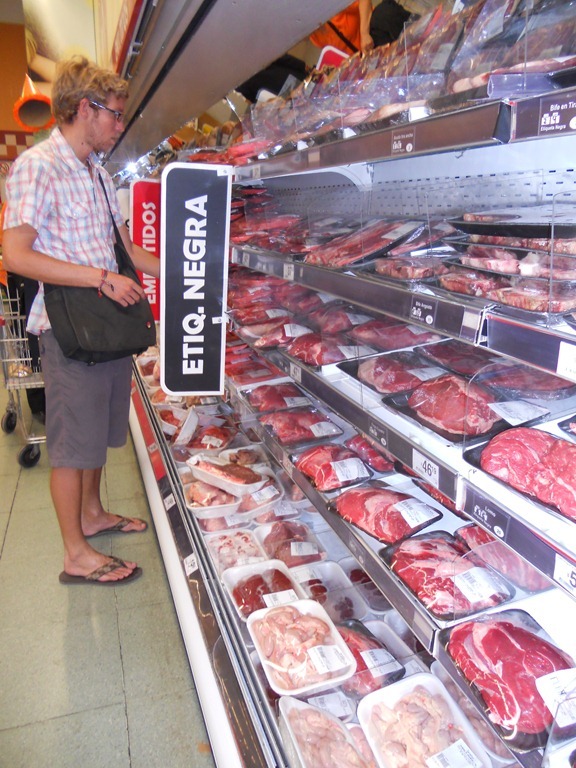 However in Argentina the meat is better and you can buy some great sausages. Therefore I’ve been following an old tip Jamie Oliver gave in one of his Italian cook books…peel off the sausage skin and make meatballs…really easy & tasty! Buying snacks (crisps, chocolates, biscuits) is something I love to do but if you want to keep your budget down it has to stop . Don’t worry a cheaper snack alternative is here (ha-ha I’m making myself laugh writing this). 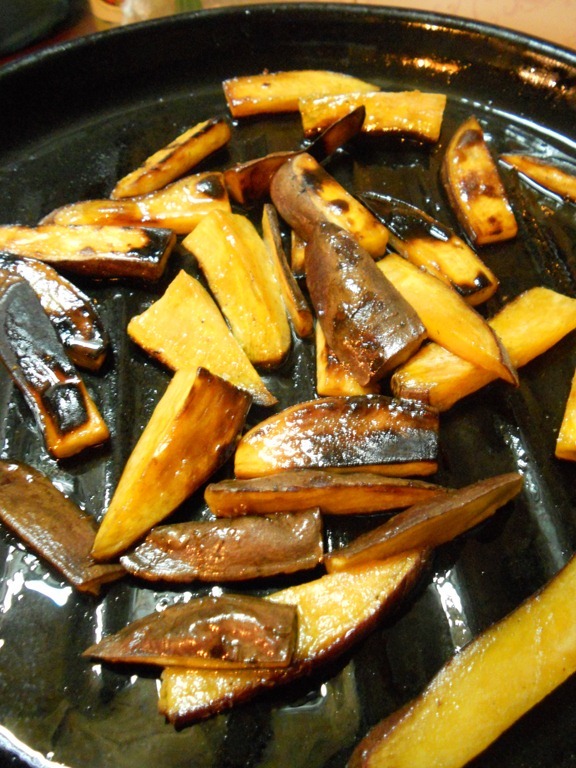 Fry some sweet potatoes and you’ve got a plate of sweet potato chips. A bag of Lays crisps cost about 9 Argentine Pesos but a couple of sweet potatoes from the market cost about 2 Argentine Pesos and you get much more. Another cheaper, alternative travel snack food is pancakes. If you’re staying somewhere long enough a bag of flour, a couple of eggs and milk cost barely anything. From one bag of flour you can make tons of pancakes. Plus you can get oranges and lemons from the market for toppings. Pancakes are a great snack which is far cheaper and lasts longer than a chocolate bar. I’ve found along the way that the supermarket is often cheaper than the local market. I don’t like to admit this because I love going to the local market, it’s incredibly interesting and entertaining. However I’ve found that the sellers at the local market will always try and rip me off because I’m a tourist, therefore the set prices at the supermarket are often a lot cheaper. (Photos: Top row, open cow heads & brains in Samaipata, Bolivia. 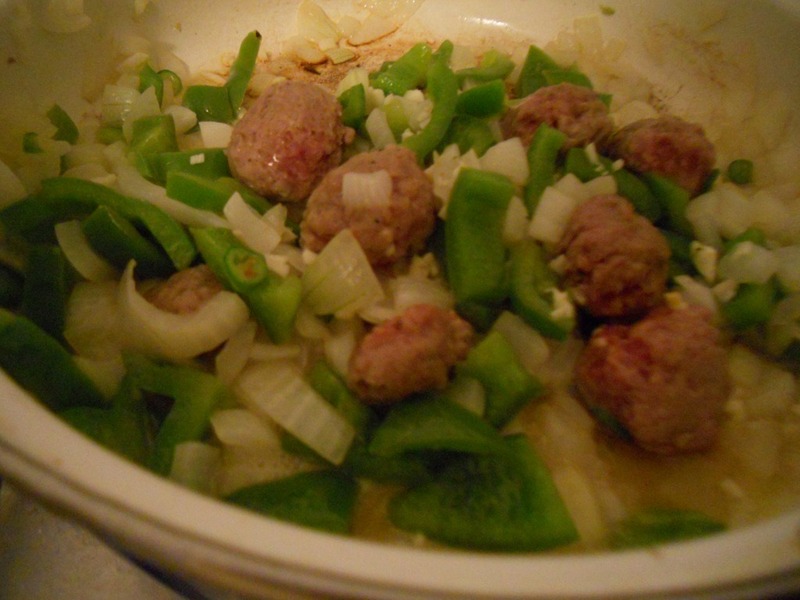 Second row, sausage meatballs and making pancake batter. 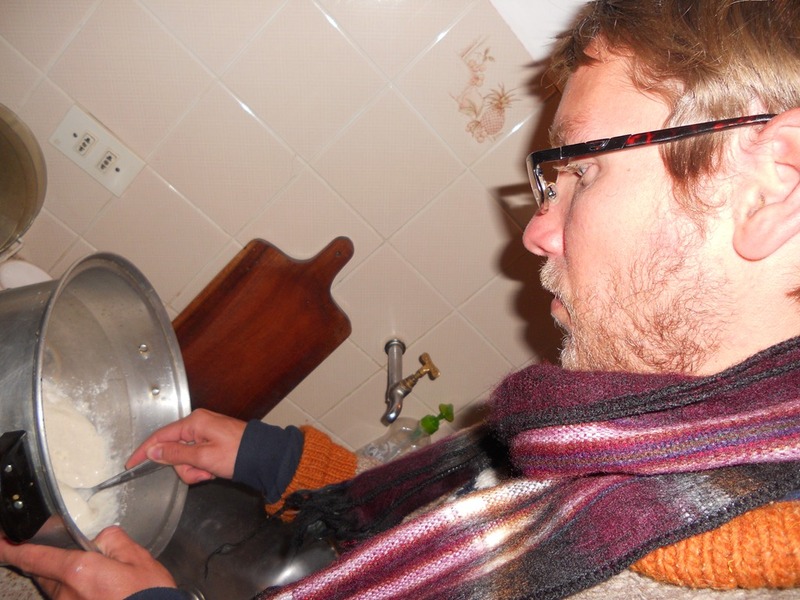 Third row, more home cooked meals in Bolivia. Fourth row, eating with our hands in Huamahuaca, Argentina, what idiots! Fifth row, another room that comes with its own kitchen in Tafi del Valle, Argentina. Sixth row, sweet potato chips, a great cheap snack and a pasta dish with homemade garlic bread). Ok, that’s all, I must stop. Every time I write a blog I think oh this one will be short but it never is. I can never stop typing, I’m not sure how many people actually manage to read to the end! Thanks for reading, I’m off to cook! ♦ My last blog post was about how difficult it is to get change in South America. Read it here, where did all the change go? ♦ Check this out the new travelling map I´ve added to the section My Travels…South America created by WildYellowBelly Photography. It shows the route I´ve taken so far from Venezuela to Argentina. ♦ Take a look at TravellingFletcher YouTube page. I’ve been adding more travelling videos to this channel. ♦ Check out the newly updated section My Travels… Asia. Now including Sri Lanka, India, Indonesia and Thailand. Argentina sounds like my kind of place some good tips keep up the good work got gran following your blog now!!! !